I’m not always precisely on time, even when it comes to holidays. So it took me until yesterday to start hunting for the menorah and thinking about Hanukkah presents and food. Naturally, I wanted to make the traditional potato pancakes IMMEDIATELY. We had only one potato in the house, however. 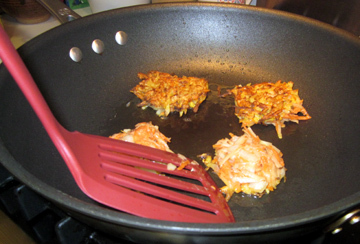 So I decided to try making latkes with half potato and half carrot, creating something I call a Carlatke. The experiment was a rousing success. The carrots lent a sweet touch (and of course their lovely color) to the salty pancakes. Wash and trim the potato and carrots well. Peel the potato if you want to (the skin is nutritious so you don’t have to). Grate everything using either a box grater or the grater attachment of a food processor. Wrap the grated vegetables in a dishtowel or paper towel while you assemble the remaining ingredients; this will make the veggies a little less wet and a little more inclined to cohere into a pancake. In a medium bowl, combine the potato and carrot pieces, the onion, the eggs, the flour, and the salt and pepper. In a large frying pan, heat a couple of tablespoons of oil until the oil begins to shimmer. I prefer to use a nonstick pan as this minimizes the amount of oil needed. Scoop some of the potato-and-carrot mixture out of the bowl with a soup spoon, and flatten it with your hand. Pop the flattened mixture into the hot oil. It should hiss and bubble a bit; if not, wait before you put more pancakes into the oil. Fry the pancakes a few at a time, turning each when the first side turns a golden brown. Drain the cooked latkes on paper towels; then pop them into a 250-degree oven to stay warm until their cousins are finished cooking. Serve alone or with applesauce or cranberry sauce. Makes about 12 smallish pancakes. This entry was posted on Tuesday, December 7th, 2010 at 4:00 am	and is filed under Holiday Foods, Vegetables. You can follow any responses to this entry through the RSS 2.0 feed. You can leave a response, or trackback from your own site. What a great-looking recipe — I can’t wait to try it! 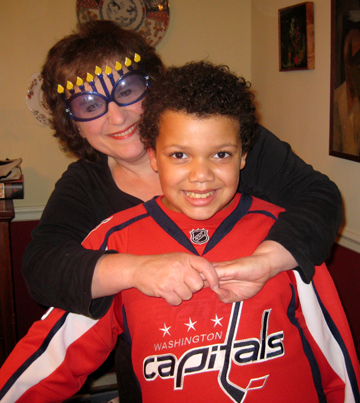 And what a darling photo of you and Michael — and where do you get those glasses???! I was thinking of you as I constructed a winter casserole out of what I had in the house: apples, onions, pumpkin, squash and lots of carrots. It turned out remarkably well, with the apple-onion taste dominating. It was improved by serving it with a dash of white wine over the top. . . They look yummy and I’m going to try these. Michael has a great smile. Is he always there when you cook and get to taste everything first? Lucky Michael. We lived above my grandparents and I used to hang around my grandmother’s at meal times which were earlier than ours. At first I thought, “Oh my Lord, that Tinky! Now she’s trying to cook in the car . . . and do they even HAVE cigarette lighters in cars anymore?” Nice idea; I’m going to try it! They look delicious. Last week in search of comfort food, we had fried potatoes! I parboiled them, sliced them, then shallow fried them in rapeseed oil … yummy! Audrey discovered latkes last year and fell in love with them so I’ll have to try yours with carrots. I’ve never actually made latkes though I’ve always loved them. 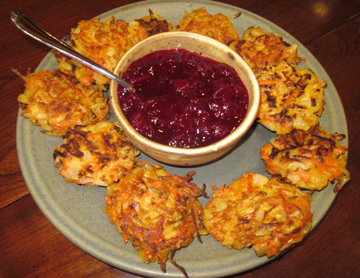 Yours look wonderful and I love the idea of serving them with my leftover cranberry sauce. And your glasses are fabulous! Tinky, I love your latkes idea. Actually, I bought the potatoes for my latkes yesterday. I usually try to celebrate Hanukkah in the first couple of days, but I got behind this year and planned on making them today. My latkes are usually awful, though. Not at all crisp and crunchy, but instead flabby and sad looking. I’ll try your version, but I think the problem is with the cook. I’m definitely Latke-challenged. Love the photo of you kids! Again, Happy Hanukkah. Alice, your casserole sounds great. Ginny, you made my laugh; I never thought of “car” in that context! Abigail, your daughter is wise. BumbleVee, I have NOT made cranberry biscotti–I’ve only made biscotti once, and they were not a success–but I will try again with your inspiration. And I’m glad you get a kickc out of the photo. Grad, if you are only fearless your latkes will be a triumph. Thanks, all, for the comments on the photo; it’s hard not to have fun with Michael around. In answer to your question, Adelaide, he’s not ALWAYS around when I cook–but he’s there frequently, and he’s always an eloquent taster!